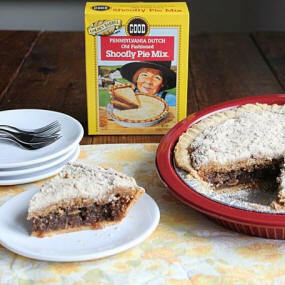 Shoofly Pie is a traditional PA Dutch desert. When the early German settlers came to North America they brought with them non-perishable goods on ships that would survive the long voyage to America. Staples such as brown sugar, flour, molasses, shortening, salt, and spices were used to create a three-layer pie with a gooey bottom, a cake-like middle, and a crumb topping. Baked and left to cool outside, these pies not only garnered rousing approval from the settlers, but a few flies buzzed around, too, giving this native East Coast dish its name. 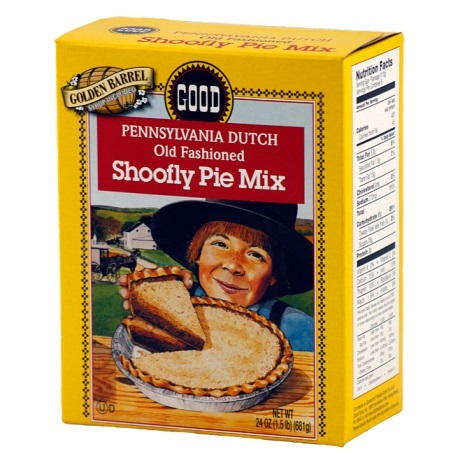 Perhaps no other single dessert is so identified with Amish Country as is the shoofly pie. Delicious served warm and topped with whipped cream or a side of ice cream! Tastes great with a cup of coffee, too. Shoofly Pie Mix - Everything you need (except the pie crust) to make this classic Pennsylvania Dutch favorite! Follow three simple steps to make your own Pennsylvania Dutch old fashioned Shoofly Pie.